You can add transitions between slides: Not only can you use simple fades to go from one slide to the next in your presentation, but you now have a gallery of fancier 3D effects at your disposal. This is pretty basic stuff, though, so it's curious that it took Google so long to add this feature to the app. You can add animation to your slides. You always need to be careful with animation, though, because it can rob your presentation of the kind of gravitas you sometimes need for you to be taken seriously by your audience. You can give your presentation a polished look with the new themes that Google has added to the package. A problem with themes, though, is they can give your presentation a "canned" look. You can use the app's new set of drawing tools to build designs, layouts, and flowcharts within a presentation. You can jazz up tables included in your slides by merging cells and using the app's new style options to add some flair to your numbers. One of the drawbacks of the new offering is that it incorporates technology found only in the newer versions of popular Web browsers--Google Chrome, Safari 5, Internet Explorer 9 or Firefox 4 or newer. You can gain full access to the app's new features in IE8 if you install Google Chrome Frame on your system. You also need to be a good speller with presentations, as spell checking hasn't been incorporated into the app yet. Offline editing is still missing, too. 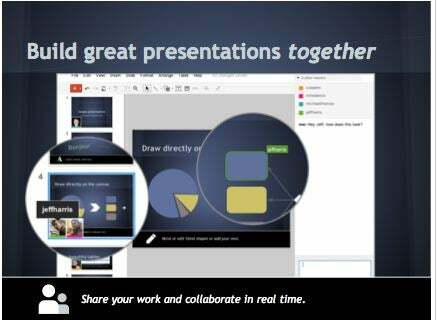 Needless to say, many of the new features in presentations have been available in full featured packages like Microsoft PowerPoint and Apple's Keynote for years, although collaborating in those programs isn't as slick as it is in Google Docs presentation builder, where you can see exactly what others are working on with colorful presence markers and edit simultaneously from different locations. You can also view a revision history of a project and roll it back to a previous version, as well as chat with others who working on a presentation with you. To try out new presentations, you click on the gear icon in the document list within Google docs and select Document Settings. Then, from the Editing tab, check "Create new presentations using the latest version of presentation editor."